Here are some tips to help the process along, and to make potty training as easy as possible for everyone. Potty training is one of those rites of passage for both toddlers and parents, and it’s different for every family. Some kids take to the process easily, never looking back and eagerly going to the potty when they feel the urge. Other children will need some extra coaxing, incentives and tricks to get them to be regular users of the potty. Here are some tips to help the process along, and to make potty training as easy as possible for everyone. Buy a small potty and place it in a convenient location so your child has easy access to it. You can keep a potty in the bathroom, and also in the corner of a kitchen and playroom if that’s where your child spends the most time. You can also buy a smaller toilet seat that lays on top of the adult seat so your child can comfortably sit without fear of falling into a regular toilet. When your child is first learning to use the potty, it’s important that they feel comfortable and safe. Some children may be afraid of the flushing action and sound. You can cover the automatic flush sensor in a public restroom with a small sticky note to prevent it from going off too soon. Teach your child to wash their hands with soap after a trip to the potty. Make this habit part of the routine, even if they only sit on the potty without going. Little kids especially love foam hand soaps in fun colors and scents. Don’t rush nighttime potty training. Being able to sleep through the night without an accident can take time. “Day training and night training are completely different animals, since night training is dependent on your child’s physical development. 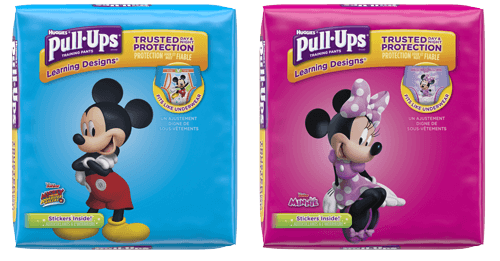 There’s no trick to speed it up, so in the meantime use Pull-Ups® Night*Time Training Pants with extra absorbency,” says Dr. Heather Wittenberg, child development expert and Pull-Ups® partner. Initially, it is easier for boys to learn how to use the potty sitting down. Once they are ready to start peeing while standing up, there are some tried and true potty training tips to help them aim into the toilet. Try blue coloring in the bowl, which will turn to green when the urine accurately gets into its target. You can also float some O shaped cereal in the toilet bowl or potty and have your boy aim for them in the bowl. Create a sticker chart and make attainable prizes as rewards for going on the potty. But don’t make them wait for too long to see the benefits. It’s most effective to let him pick a small sticker to put on the chart every time they’re successful on the potty. You could also try another small reward such as a tiny cookie or a mini marshmallow. Have your child show their stickers and treats to family members and friends to celebrate their progress. Potty training is a journey, but it doesn’t have to be an arduous one. Take cues from your child to see if they are ready to begin, and then stick to a routine of rewards and encouragement. Regression and accidents happen, but don't make a big deal out of them. If you keep positive and focus on the progress your child is making, before you know it your toddler will be a potty pro!